I strongly believe that you can learn a lot – and some of the most important things – by asking questions and listening to others’ perspectives. This principle is even more critical as the County Executive. Whether it is touring local businesses, talking with citizens and employees, or riding along with our first responders, seeing and hearing things first-hand is vitally important. While I am very pleased with all we have accomplished in the last 16 months, it is time for me to get a perspective check. 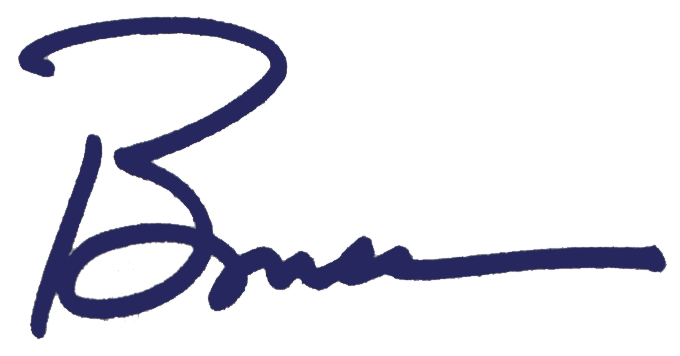 So, for the next couple of months, I am going to be out meeting one-to-one and in small groups with our County leaders and employees. These meetings will be a huge focus for the next two months and the importance of this effort was reinforced yesterday when I met Deputy Marty Zurfluh at 0630 for a ride-along with the Mountain Detachment. I had never been out with “D10” and it was particularly important to me since Deputy McCartney worked there. A Thursday morning in rural Pierce County seemed like a good opportunity to talk with Deputy Zurfluh and his fellow deputies. We started with a quick meeting over coffee with Sergeant Frank Clark and Deputy Jon Collins in Eatonville. Much of what I heard was no surprise – with some similarities to my time with Deputy Jake Kreis in the Key Peninsula. Most of those working in the Mountain Detachment like both working and living there. They are part of the community. We were talking about the valuable work of Community Liaison Deputies, our Code Enforcement Team, and our behavioral health efforts when a radio call came in. (Note – I have been on many ride-alongs over the years, but still can hardly make out anything intelligible when radio calls come in). In an instant, as they heard “shots fired” near Roy, their tone changed from easy conversation to serious professionalism as they popped to their feet and headed to their patrol vehicle. A 15-minute drive with three vehicles running lights and sirens began. My thoughts went to Deputy Sydney Davis and her accident – please keep her recovery in your thoughts and prayers. I was impressed with Deputy Zurfluh’s defensive driving – anticipating the actions of other drivers – at high-speed in a Tahoe – which doesn’t handle like a NASCAR! I had a new perspective on Pierce County’s back roads – and gained an appreciation for letting emergency vehicles pass when there is a deep ditch and no shoulder! I saw first-hand the challenges of interviewing a nearly hysterical woman who had been drinking and was assaulted. Deputy Zurfluh’s professionalism and compassion were commendable as he worked doggedly to determine the facts. Sergeant Clark had to wrestle with many difficult questions. What really happened? Where is the subject? What is the threat to the community? How does he keep his deputies safe? How do we keep this from escalating? The alleged assailant was a 50-year-old male with a felony conviction and known to have multiple firearms, including a hunting rifle. After attempting, unsuccessfully, to convince the subject to come out and surrender, Sergeant Clark (a former SWAT member) made the smart decision of calling in SWAT. So, for the second time in two weeks, I saw our SWAT team in action. Last time was in an active shooter training exercise (see “Standing in the Gap” blog), but this was no exercise. The team arrived quickly (they were already together training in another part of the County), under the leadership of Sergeant Tony Messineo. They came with their armored vehicle – critical for approaching up a long-exposed driveway – and their command post (CP). I took the opportunity to observe the negotiation team in the CP. The four-member team represented a range of ages, ethnicities, and genders. Their goal is to find a way to “connect” with subjects, so the range of backgrounds was strategic and intentional. Sometimes a younger woman has the best chance of success, other times an older man. Today, Deputy Roland Bautista was first up and was calling every known number trying to reach the subject. After several voicemails, I thought the SWAT team was going to have to enter the home. Fortunately for all concerned, Deputy Bautista finally got the subject on the phone and convinced him to surrender peacefully. I went over to thank Deputy Zurfluh for my eventful ride-along – and found him questioning the subject in the back of his Tahoe. As I watched, I noted he treated the obviously drunk subject with dignity – wow! Observing, asking questions, and listening yesterday taught me a lot about the courage, professionalism and teamwork in our Sheriff’s Department. I am looking forward to continuing that kind of interaction with other departments over the next couple of months. 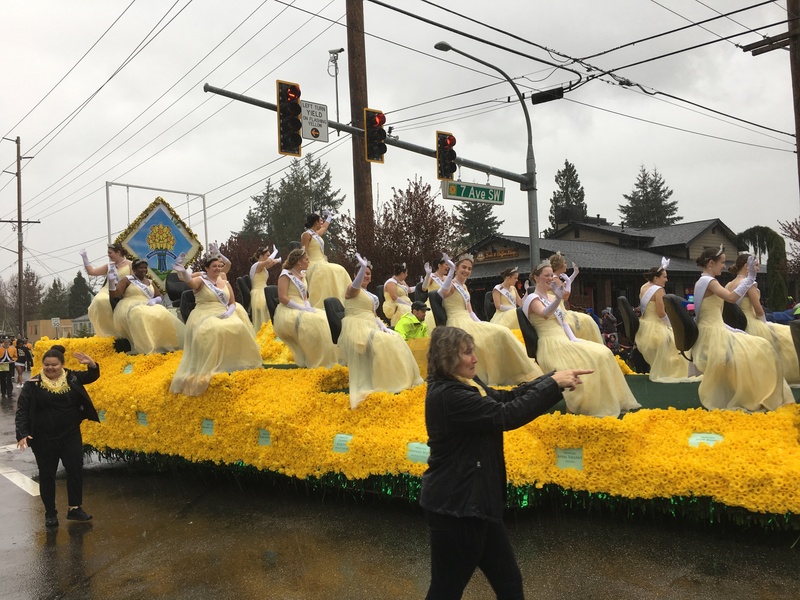 At the other end of the spectrum, I represented the County in the Daffodil Parade in all four cities last Saturday, despite the ominous weather. This is always a special day for many in Pierce County, filled with rich tradition. Tacoma, Puyallup, Sumner and Orting all approach “their” parades differently, reflecting the unique nature of their communities. I gathered a few interesting facts last Saturday. 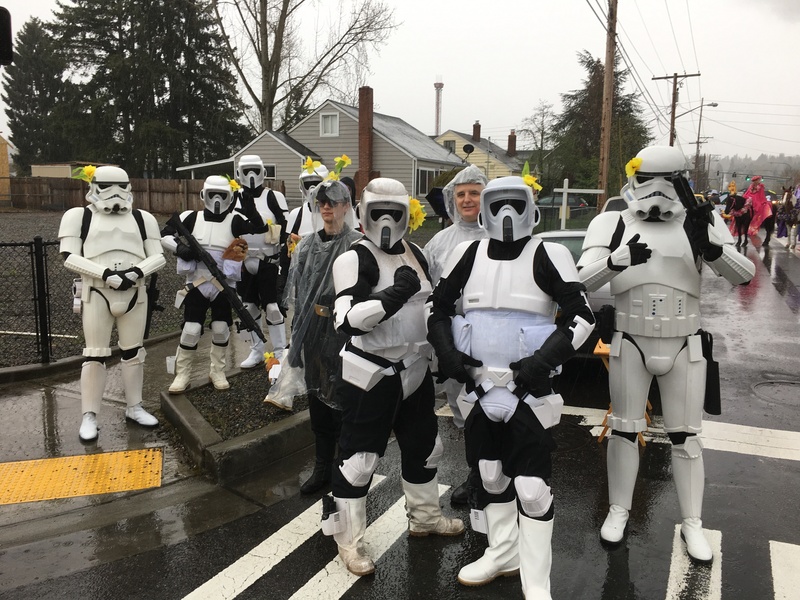 Most people think about how many people line the streets to watch the parade, but did you know over 4,000 people walked, marched or rode in the Puyallup leg? You might never think of the hundreds of volunteers from each community who work “behind the scenes.” Stan Cross has been working the parade since 1969 – and has not missed one! 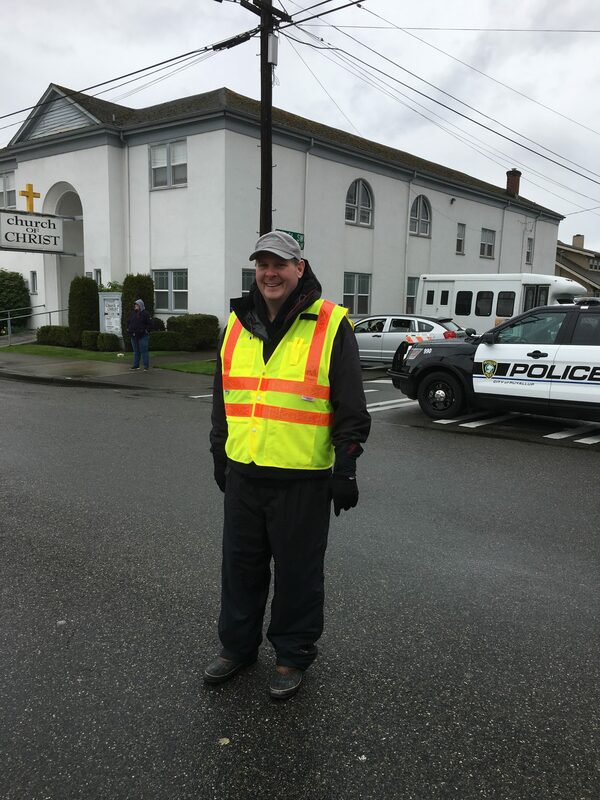 Even our own Dan Grimm has been directing traffic at the same corner for over 20 years. As I wrap up, I want to acknowledge Bret Carlstad, who has decided to retire today after 12 years as our Director of Facilities Management. Bret has done a fantastic job leading the Facilities department and I was happy to declare April 12 as “Bret Carlstad Day” in the County. We will miss his dedication to excellence, commitment to his team and his joyful approach to his work. Thank you, Bret, for your many contributions to Pierce County! I’m pleased to announce that Karl Imlig, Wastewater Utility Manager in Planning and Public Works, is coming on board as the Acting Director of Facilities Management, effective April 16th. You may remember that Karl was awarded a 2017 Standing Ovation Leadership Award for his fantastic work on the expansion of the Wastewater Treatment Plant. My heartfelt thanks to Tia Bertrand, who has been gamely wearing two hats at once. Tia had just been named Assistant Director of Facilities Management when I asked her to return to HR to serve as the Interim Director of Human Resources while we searched for a new director. Thank you, Tia! With Tia moving back to Facilities, I’ve asked Joe Carrillo, Deputy Director of HR and Labor Relations, to step up and lead the HR team as the department’s Acting Director. We should be completing our search for a Director shortly, but until then, Joe will be a great leader. Thanks, Joe! Phew – that’s enough for now.